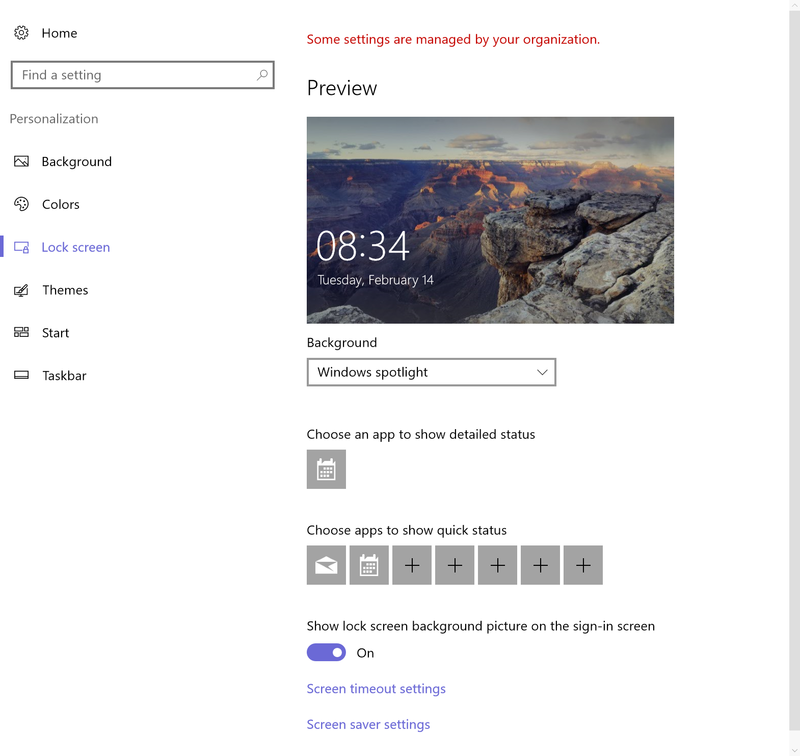 Windows 10 gives you options to customize the way the Lock screen looks and functions. For example, maybe you want to change the picture displayed on the Lock screen. Or maybe you want to choose the apps that run in the background and display information on the Lock screen (such as the Mail app, showing how many unread e-mails you have). Only apps written to do so can display status on the Lock screen. Depending on their design, some apps can display basic information, while others can display detailed status. The Calendar app is an example of an app that can display detailed status. To customize the Lock screen, open the Start Menu, click or tap Settings, and then click or tap Personalization. In the Settings app, click or tap Lock Screen to display the options. Windows 10 provides a small number of stock images from which you can choose for the Lock screen. Just click an image to set it as the background for the Lock screen, or click Browse to choose a photo or other image stored on your device. The options in the lower half of the Lock Screen page let you choose which apps display status updates on the Lock screen. You can turn on or off the Weather, Mail, Calendar, Store, Xbox, Alarms & Clock, and People apps. To add an app, click one of the available boxes (with the plus sign in the middle) and choose an app from the resulting pop-up menu. To change which app displays detailed status, click the detailed status icon and choose the desired app.